The Diablo Valley Literacy Council welcomes volunteers to tutor adults in English in the Diablo Valley area of Concord, Martinez, Pleasant Hill, Clayton, Pacheco, Walnut Creek, and Lafayette. We need tutors who can commit to 1 or 2 hours of tutoring per week on a regular basis. We provide training, match you to a student and help start your 1-on-1 tutoring. Alternatively you may leave a message at (925) 685-3881 or email dvlc4esl@gmail.com. 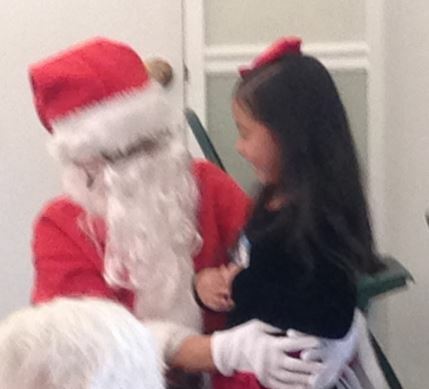 What a convivial Holiday Luncheon we had on Saturday, December 8th! Ela and her hospitality committee: Mary, Renaye, and Rachel, know how to throw a party, that's for sure. The Fellowship Hall was beautifully festive for the occasion and the room was filled with tables which barely accommodated all the tutors, adult ESL students, children, and guests who arrived. The buffet held ethnic dishes, such as enchiladas, Italian sausage and pasta, spanakopita, won tons, many types of salads. The dessert table had a wide variety of delectables to choose from. One of the students won a $50 Macy's card in a drawing that all of the attending ESL students were entered into. Children received books as gifts from...SANTA CLAUS.